Chelsea target Jordan Pickford has spoken about transfer talk linking him to Chelsea and his season aspirations. Pickford has been speculated to take the number one spot at Stamford Bridge if Thibaut Courtois leaves the club this summer. Chelsea have been rocked with uncertainty over the goalkeeping position as Courtois is weighing his options with the Blues. It had been suggested by many media sources that he is on his way to Real Madrid this summer. Courtois has previously stated his desire to move to Madrid as his partner and two children reside in the Spanish Capital Madrid. Pickford in an interview spoke of his desire to remain with the Toffees ahead of the new season and hopes to have a productive season next season. He also dismissed links to Chelsea insisting that his focus was on Everton and is raring to start the season. “I will go in on Friday and the first thing I will do is ask for some game-time on Saturday, hopefully to get the chance to play against Wolves the following week. “I know myself that I will be more than ready so I can’t wait,” Pickford concluded. Pickford has emerged over the past two seasons as one of the brightest shot-stoppers in England, from his humble beginning in Sunderland to a £30 million move to Everton last season. 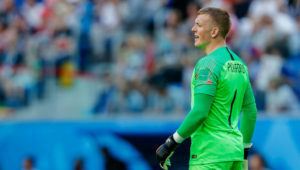 The 24-year-old had an outstanding world Cup impressing with strings of saves as England reached the semifinals for the first time in 28 years.